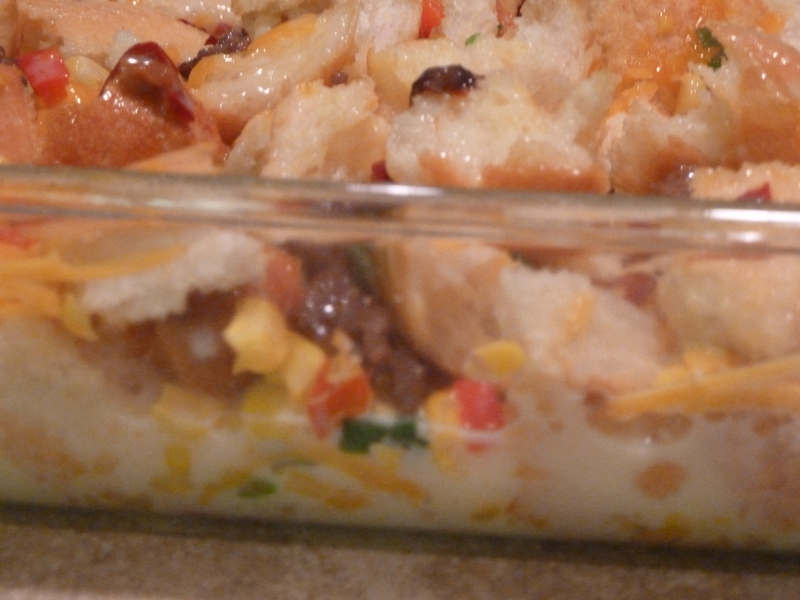 southwestern bread pudding | Is there any wine left? This dish is sneaky! It tastes really rich and decadent, but has lots of veggies in it so you don’t have to feel guilty about indulging. I feel like that is misleading. In the interest of full disclosure, it also has cheese and chorizo in it. But this isn’t a health food blog. So just make it, eat it, enjoy it…and focus on the vegetables. 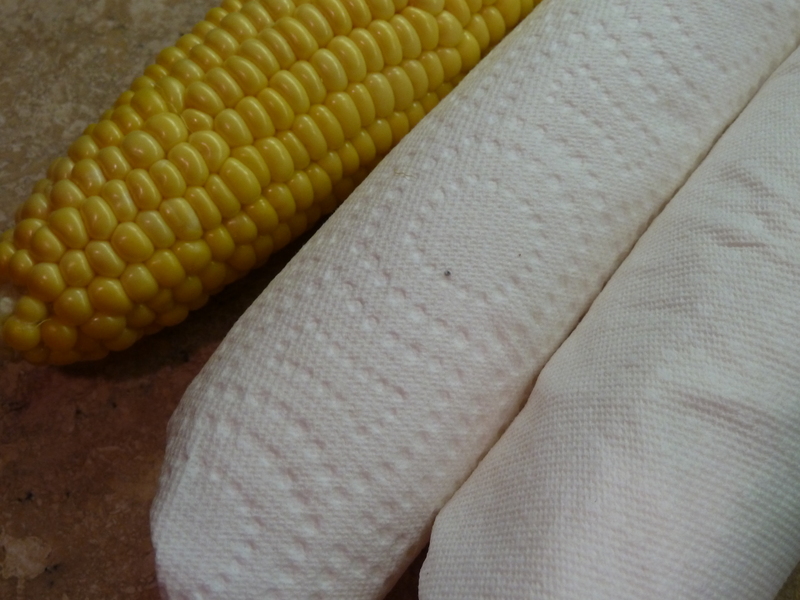 Here’s a trick my father-in-law taught me: wrap an ear of corn in a damp paper towel and cook for one minute in the microwave. Two ears? Two minutes. And so on. 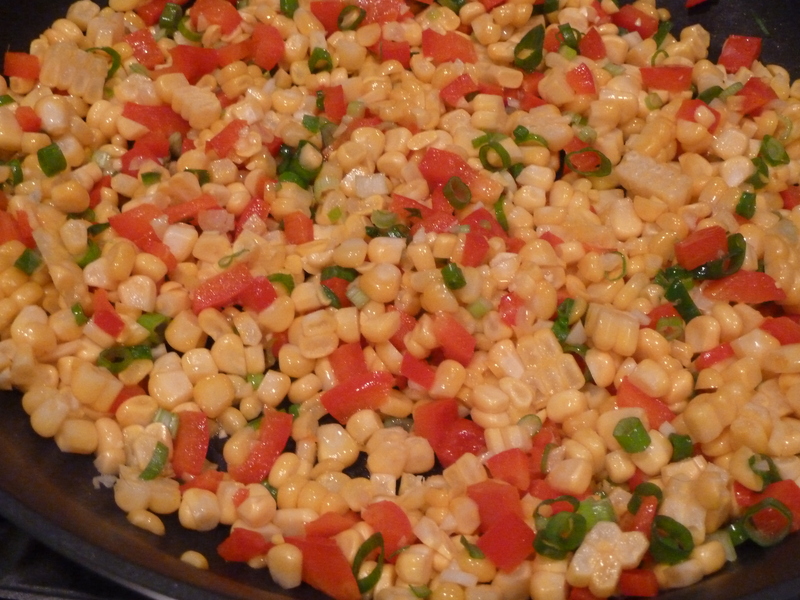 It perfectly cooks the corn so it is tender but still crunchy. In a skillet, saute the diced red bell pepper and diced jalapenos. Cut the kernels off of the cob and add them to the pan along with the green onions and garlic; sauté 3 minutes. Remove the vegetable mixture from the pan and add the chorizo to the saute pan. Using your spatula, break up the chorizo and cook for 5-6 minutes, until browned. Tear the loaf of french bread into 1-inch cubes. 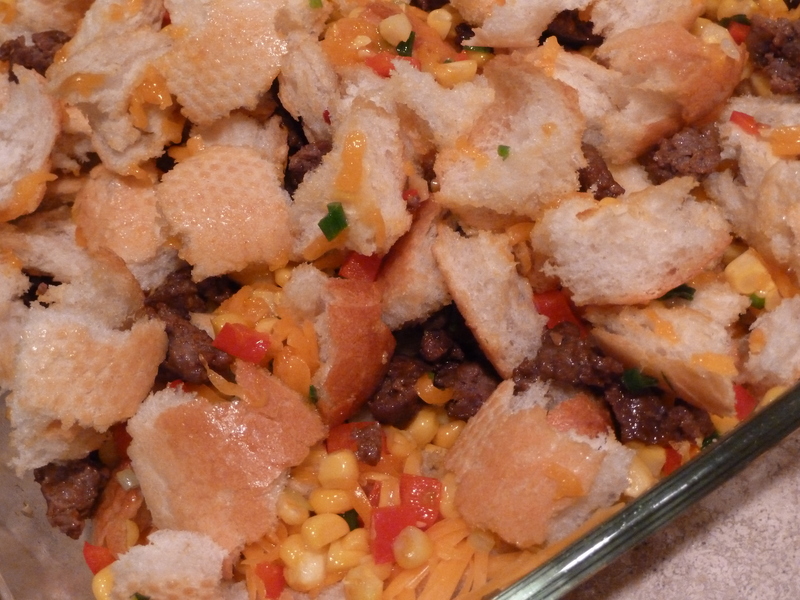 Toss the chorizo, shredded cheddar cheese and vegetable mixture with the bread cubes in a greased 9″x13″ pan. This is when you need to make your decision about the cheese…. does it look like there is enough? Probably not. Be safe and add some more. 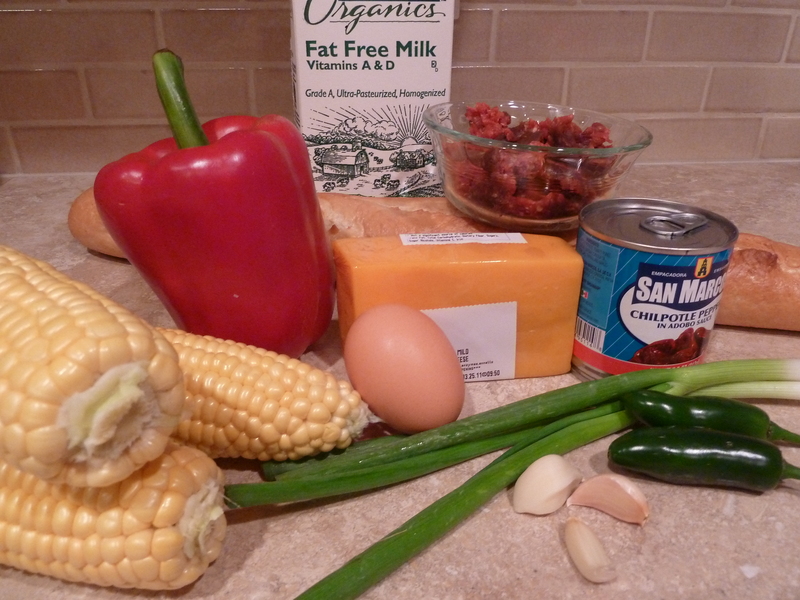 In a bowl, whisk the eggs then add the milk, cumin, salt and chipotle chiles. Pour this over the bread mixture and use your hands to press the bread down into the milk so it absorbs into each piece. If there is even still cheese left in your house at this point, sprinkle a little more on the top of the bread pudding before baking. 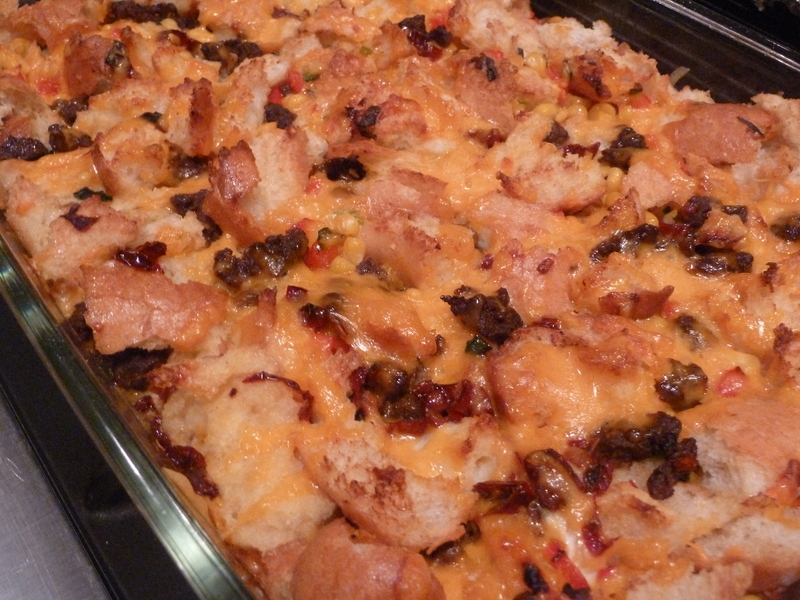 Bake the bread pudding at 350° for 45 minutes or until pudding is set and lightly browned. In a large saute pan, cook the bell pepper and jalapeno for 5 minutes or until tender. Add corn, green onions, and garlic; sauté 3 minutes. Remove the vegetable mixture from the pan and add the chorizo to the saute pan. Using your spatula, break up the chorizo and cook for 5-6 minutes, until browned. Combine salt, cumin, milk, eggs, and chipotle chiles in a large bowl, stirring with a whisk. 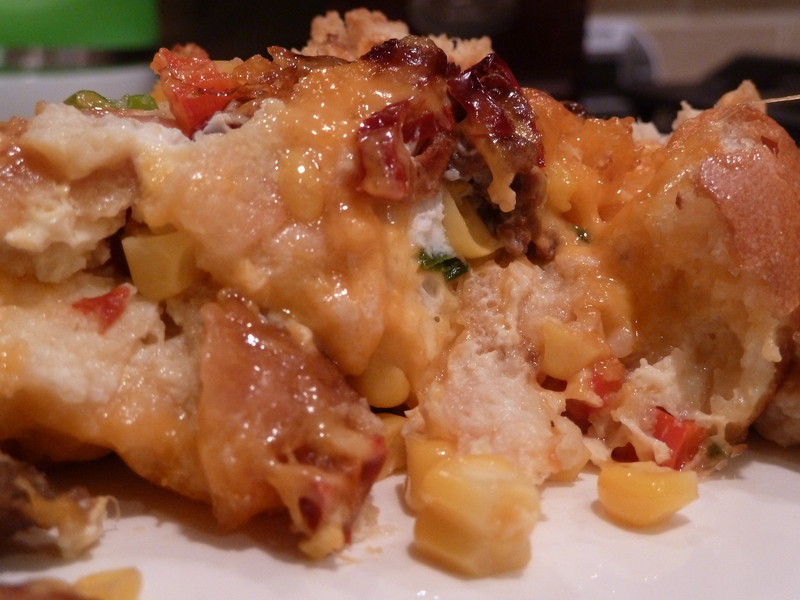 Combine the corn mixture, bread, chorizo and shredded cheddar cheese in a 9″x13″ baking dish; stir gently to combine. Pour the milk mixture over the bread and let stand 10 minutes. Sprinkle with remaining 1/2 cup cheese. Bake at 350° for 45 minutes or until pudding is set and lightly browned. As much as we like (really, love) cheese, we should learn to make our own! No kidding! I actually tried to make goat cheese once and it was a terrible failure! I should try again. ps- I have two jars of mayhaw for you from momma. I’ll come see you in the next few weeks and bring them! This sounds very interesting! I love regular bread pudding and I’m up for anything! Thanks for sharing!